One of the best things about a Sunday roast is trying to figure out what to do with the leftovers on Monday. Leftover beef is usually added to sandwiches with lots of horseradish. There is never usually any leftover pork. Leftover chicken is where I try to be creative. In the summer it is wonderful served cold or shredded into salads, and the winter offers a wide selection of rib-sticking, warming dishes, such as my version of King Ranch Casserole. 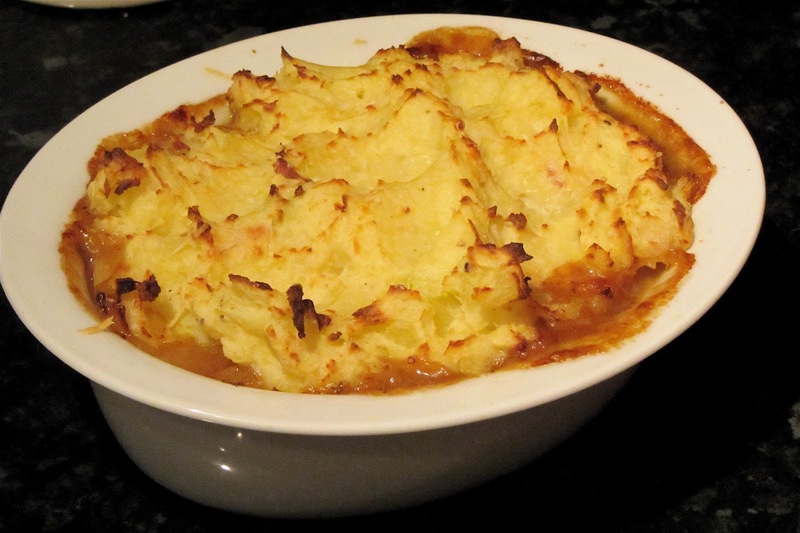 Another Monday-night favourite is this version of cottage pie made with chicken instead of beef. Not only is it gorgeously comforting, but it is the perfect way of using up leftovers as anything can be thrown in (except probably dessert). Not only is there leftover chicken, but also leftover veg and gravy too. It's a very flexible dish; throw in whatever you have to hand. In this version I had half a swede, which I decided to mash into the potatoes. It would have been just as good cubed into the chicken stew. I normally add leeks, either as part of the sauce, or stirred into the mashed potato topping. You can also incorporate cabbage or sprouts into the potato, going for a bubble and squeak vibe. The options are endless. 1. Preheat the over to 180C. 2. Heat the oil in a pan and add the onion, allowing it to soften for a few minutes. Add any raw vegetables and cook for another couple of minutes, unless you are using tender vegetables like peas, asparagus etc. Add these later. 3. Add the herbs, gravy, mustard, milk and a good grinding of black pepper. Bring to a boil and simmer for a few minutes. 4. Add the chicken and any raw tender vegetables or leftover cooked vegetables that you might be using. Bring back to a boil and thicken with the cornflour. Taste and adjust the seasoning as required. 5. Pour the the stew to an ovenproof dish and spread the mashed potato over the top. Transfer to the oven and cook for 15-20 minutes, until the potato is golden brown. Whenever I indulge in a pudding at a restaurant I automatically skip over the obligatory chocolate option. Don't get me wrong, I like chocolate, but often find chocolate desserts and cakes disappointing – brown sponge cake anyone? For a chocolate dessert to hit the spot it either needs the requisite fudgy goo, or another flavour to give an extra dimension. This pudding that I whipped up (if you pardon the pun) in no time for dinner with friends at the weekend fulfils both of these criteria. Gooey yet light, chocolatey and malty, it was ridiculously easy to make considering how delicious it tasted and impressive it looked. I'll probably continue to skip the chocolate option on restaurant menus, but I will definitely add this to my arsenal of go-to desserts. 1. Crush the biscuits into fine crumbs with a rolling pin or food processor. 2. Melt the butter and golden syrup together in the microwave and stir into the biscuit crumbs. 3. Tip the mixture into a loose bottomed cake tin, pressing down firmly to a flat layer using a potato masher. Put into the fridge to chill. 4. Whip the cream with the vanilla to the soft peak stage. 5. Finely chop both kinds of chocolate and put into a microwaveable bowl with the butter and syrup. 6. Microwave on high for 30-40 seconds, stir and repeat the process until thoroughly melted and smooth. Meanwhile, bash most of the Maltesers (reserve a few for decoration) in a polythene bag with a rolling pin. You want a mixture of fine dust and chunkier pieces. 7. 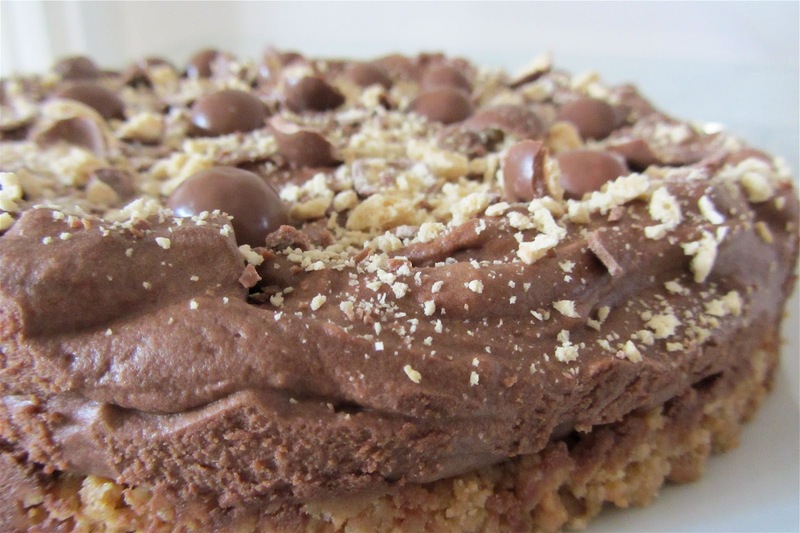 Stir a blob of the cream into the chocolate to lighten the mixture, then gently fold the remaining cream, folding in most of the crushed Maltesers at the end. 8. Pour the chocolate mixture on top of the base, smoothing out with a rubber spatula to make a nice swirly top. 9. 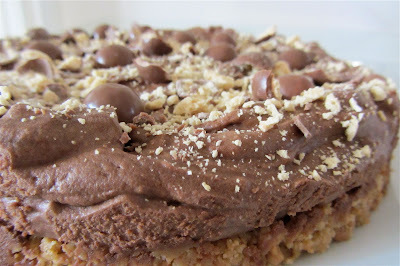 Sprinkle over the rest of the crushed Maltesers, and poke the reserved whole Maltesers randomly into the topping. 10. Chill for at least 2 hours. If keeping for longer, ensure that the tin is covered with cling film. 11. Take the tart out of the fridge 10 minutes before serving. Remove from the tin and slice into 8, serving perhaps with a little cream, ice cream or crème fraiche. Tonight was one of those moments after a long day at work where you throw together a random selection of sometimes uninspiring ingredients to produce a surprisingly delicious dinner. 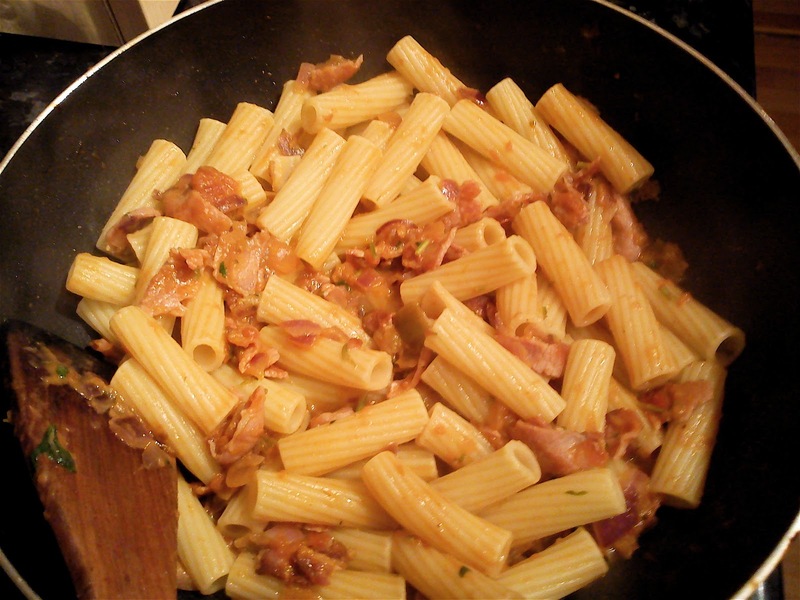 Crumbled smoked bacon, red onion, leftover salsa, a splash of milk and a little fresh coriander that had past its best made an absolutely scrumtuous meal tossed with rigatoni and topped with some grated cheddar. You could probably work this one out for yourself, but here's the recipe anyway. 1. Fry the bacon in the oil until crisp and set aside. 2. Saute the onion in the bacon juices until soft. Add the salsa and bubble up for a couple of minutes then crumble in the bacon and add the milk. If it curdles a little, some frantic stirring will set it right. 3. Allow to reduce a little Stir in the coriander, cooked pasta, a splash of the pasta water and a little cheese if you like. 4. Serve with some more grated cheese and chopped coriander scattered over the top. This is a little like bread pudding only made with waffles, tangy raspberries and creamy white chocolate. I first had this at a fete and thought it was absolutely delicious. Here is my approximation of that recipe. I can't decide whether I prefer it hot or cold. 1. Break the waffles into small pieces and put a layer on the bottom of a baking dish. 2. Add half of the chocolate and half of the raspberries. 3. 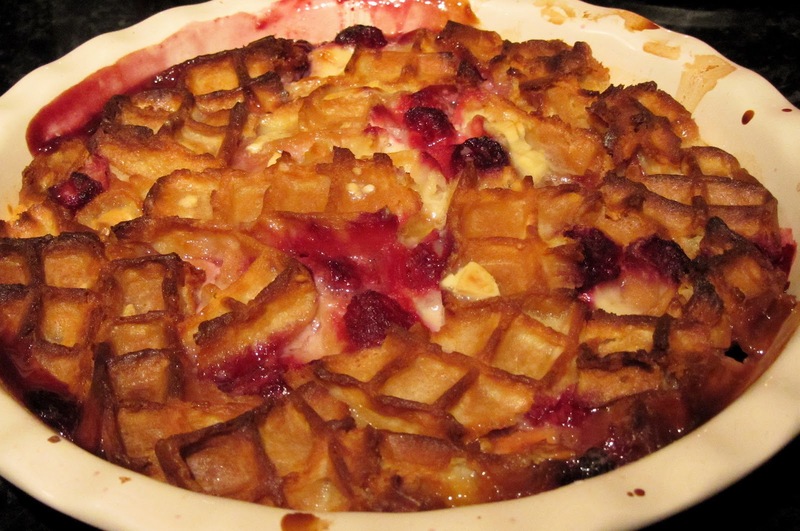 Add another layer of waffles and raspberries, then top with the last of the waffles. 4. Whisk together the sugar and cornflour to disperse any lumps of cornflour. 5. Add the vanilla, eggs, yoghurt and milk and whisk to a smooth batter. 6. Pour slowly over the waffles so that all of the top is soaked in the batter. 7. Leave to soak everything up for 20 minutes or so. 8. Bake at 170° for 40 minutes to an hour, until the top of the pudding is browned and the middle cooked through, but retaining a wobble. 9. This is best after leaving to sit for 20 minutes. It is also very good served cold. Serve with Greek yoghurt or pouring cream. One of my favourite aspects of a Sunday roast has become thinking up ways to use up the leftovers. This thought process often drives my choice of meat rather than the other way around. 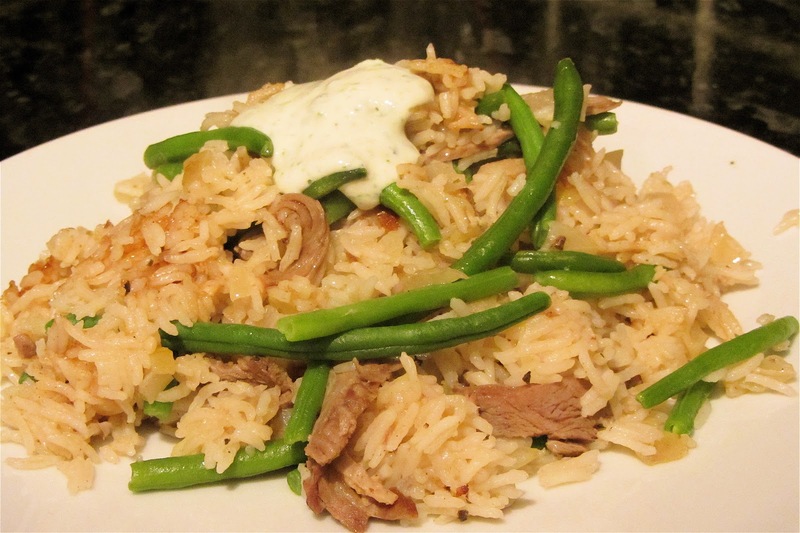 This is such a delicious way of using up lamb, with a comforting blanket of fragrant, subtly spiced rice, crunchy green beans and a vibrant yoghurt and mint sauce. 1. Measure the rice into a mug and add enough water to cover. Set aside for 20 minutes or so. 2. Make the mint yoghurt sauce by mixing all of the ingredients together. Set aside for the flavours to mingle. 3. In a lidded non-stick pan melt the butter in the oil over a low heat. Add the onions with a pinch of salt and sweat down with the lid on for about 5 minutes, stirring occasionally. 4. Add the garlic and continue to cook for another 5 minutes, until everything is turning golden. 5. Add the lamb and spices, bay and stock cube and cook briefly with the onions and garlic. 6. Tip the rice into a sieve and drain under the tap. Add to the pan with a mug full of water. 7. Give everything a brief stir, then cover and bring to a boil. Simmer, covered for 8 minutes, topping the water up if necessary. 8. Spread the green beans out over the top of the rice, re-cover the pan and cook for a further 2 minutes. 9. Serve the pilaf with some of the yoghurt mint sauce on top. 1. Season the lamb liberally with salt, freshly ground black pepper and rosemary. 2. Place in a casserole dish with a lid, or in a baking tray covered tightly with foil. 3. Cover and roast at 170 for two hours, then add the bay, onion and carrot, about a wineglass of water and an extra pinch of rosemary to the bottom of the dish. Mix well into the juices. 4. Re-cover and roast for another hour and a half, then uncovered for a final half hour. Top up the water if the veg start to catch. 5. When the lamb can be pulled apart with two forks it is ready. Set aside to rest. Drain any excess fat from the pan and mash the vegetables and caramelised juices to form the basis of a delicious gravy by adding lamb of beef stock and cornflour. A good vegetable curry is one of the basics that everyone should have in their culinary repertoire. As this recipe doesn't use ghee, yoghurt or paneer it is actually vegan. I prefer vegetable curries like this that use two or three key ingredients to those where you chuck in everything but the kitchen sink, which so often end up as generic vegetable sludge. 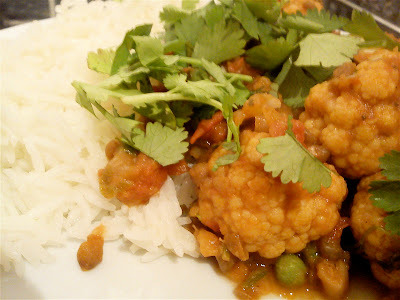 I do like a few peas in a tomato-based curry though, for their little bursts of sweetness. So many recipes for curry include an ingredients list as long as your arm, most of which are spices, added individually in precise measurements. I don't get too hung up on this and am happy to use a ready-made curry powder. Indian and Bangladeshi friends have assured me that they do the same. If you really feel bad about it, I recommend the blends sold in Asian food stores. Alternatively, customise a ready-made blend with a little extra of your favourite spice. I used to loathe cauliflower, even as an adult. Perhaps I was traumatised by memories of soggy cauliflower cheese. Eating it in a curry was the first way that I found it palatable, and now I love it in all incarnations, but I think this is still my favourite way to eat it. 1. Over a fairly low heat, sweat the onions down in the oil with a little salt for 5 minutes or so. 2. Add the garlic, cover and continue to sweat down for 5-10 minutes, or until golden. 3. Add the curry powder and cook out for a minute or so, then add the ginger and chilli, if using. 4. Cook for another couple of minutes, then add the tomatoes, sugar, lentils, water and salt, to taste. 5. Break the cauliflower into florets, cutting any large ones in half. 6. Finely chop the coriander stalks then add to the curry along with the cauliflower. Cover and cook until the cauliflower is almost cooked to your liking. Stir in the peas and cook for another couple of minutes. 7. Roughly chop the coriander leaves. Stir a little through the curry and serve with boiled basmati rice or chapatis, with the rest of the coriander sprinkled on top. Hi, I'm Andy. Pleased to meet you. You look lovely by the way.